BOWDON are the 2007 Championship winners! Southport & Birkdale runner up and Bury was placed 3rd. 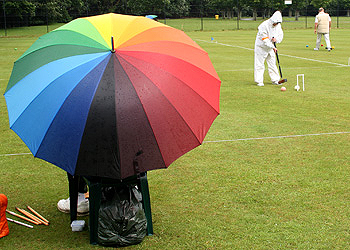 Bowdon won both the Short Croquet and Golf Croquet shields (only losing one match – to Southport in the Short event). Fylde won the Handicap Shield being undefeated in this section. Bury, Chester, and Culcheth clubs were also represented. This year Pendle & Craven, Llanfairfechan and the I.O.M.did not enter. As far as I know, there is nothing else like this event on the croquet calendar. Teams from clubs all over the area battle for five trophies in four disciplines over two days on six full and six half lawns. Many clubs use the event to give their newer rising stars a first taste of competition and for those players the wonderful sight of Southport CC full to the brim is something they always remember. But the event also allows many of the established players to get together over a weekend and promotes a sense of unity amongst the clubs in the Northwest. Nevertheless for each club it is not always easy to get teams together and so congratulations to Mike Steer and his teams from Bowdon for not only doing so but actually playing very well in the difficult conditions. Prior to this weekend the whole country had been swamped by endless rain causing many towns to be flooded for days on end. Severe weather warnings were given for the Northwest but on Saturday the lawns were good and the tournament was on with over 30 games played.. Rain fell constantly and everyone needed their waterproofs on. This rather reduced the effect of having team colours for the first time but there were many special touches to be seen here and there. A special mention to Bowdon for their Orangeness and to Sylvia Steer for the shoelaces! Only towards the end of Saturday did the lawns begin to puddle. 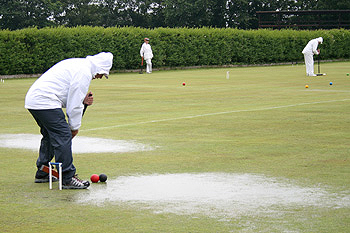 During the night the rain just got worse and in the morning it was clear that play would not be possible. (A lucky escape for Dave Nick, scheduled to play Advanced Doubles in pink). Although the second day was abandoned, the schedule of play from Saturady enabled Keith Roberts, the tournament manager, to produce results in all events except the Advanced Doubles. ( The Advanced was scheduled as all play all over two days; 3 Saturday, 2 Sunday, unlike the Golf, Short and Handicap events which were all play all on each day. As Sunday’s play was cancelled it was not possible to determine a winner as some teams had only played one game relevant to the Championship (games vs Manager’s Select don’t count)). With no play on the Sunday, trophies were left unpresented and will be formally awarded at the NW Fed Annual Meeting in November at Culcheth.